Do you know, the South West Monsoon is just about 35 days away from its normal date of arrival from the shores of India ? Yes ! its just 35 days from the Southern most point of India on the South Andaman Islands, Indira Point, where the normal arrival date is 15th May. The Sub-Continent is eagerly awaiting for its share of 2013 monsoon rains ! This annual series is a follow up and chasing of the South-West Monsoon. Every article in this series explains the synoptic situation as it actually is, and based on the day's position, the date and quantum of rains as on THIS SITUATION. It is very important to firstly estimate the date of arrival of the S W Monsoon, as year to year, variations in dates of onset of the monsoon can occur and there have been several occasions in the past when the monsoon arrived over certain parts of the country about a fortnight earlier or later than the normal dates. Initially, in the first few articles, this series will be chasing and closely following up the actual developments of the monsoon parameters, and analyzing its progress regionally for calculating and estimating the arrival date. B) below indicates the actual situation of the parameters situation today (10th April). A) Very very briefly, let us first understand, that the "power house" of our SWM is actually based far away in the southern Hemisphere. The main "generating factory" is the Mascarene Highs, between SE of the Madagascar coast and Australia. The SWM is born down South, 4000 kms from the Indian Mainland ! And to attract the SW winds, again, we need a good proper "seasonal low" to develop in the Sub-Continent. This seasonal low, normally should start forming around Barmer, Rajasthan, by mid April, and at its peak stretch upto Arabia. Seasonal low at its peak, in June, should normally be around 994 mb, and the ridge around Kerala should be 1008 mb. This enables a good gradiant to pull the SWM Northwards and inland. B)-In this initial stage, we will observe the basic root and foundation, the initial 4 parameters only, and the initial seed of the monsoon. From these parameteres, later a few more develop. 1. Cross Equatorial Winds should normally start forming, and taking shape from mid -April, especially in the South Indian ocean region. But things are messy below the Equator. Currently the MJO has stalled in the Eastern Indian Ocean region, with 3 embeddded lows. For the Bay branch, we have an interaction of a Rossby Wave and the MJO, which has formed a cyclone heading towards the NW Australian coast. 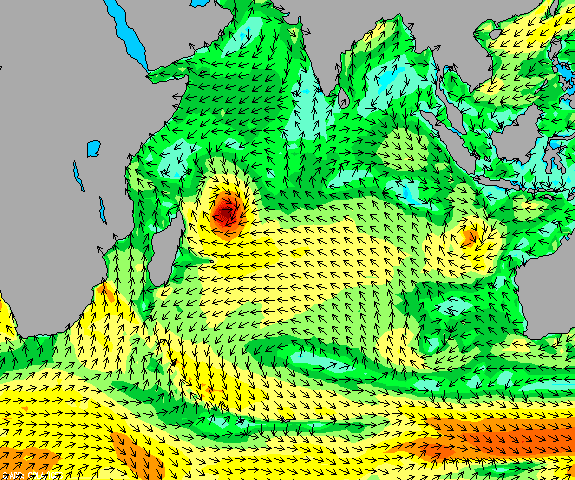 This Cyclone "Victoria" is expected to move Southwards, and further pull down the trough towards the South. Tropical cyclone forming in the S.Indian Ocean off the Australian Coast, means a marginal delay in the Mascrene highs strengthening. ..ITCZ today is around 7S. Initial forming off the East African Coast, has been disturbed by another Cyclone "Imelda" off the NE coast of Madagascar. The winds are pulled towards the cyclone, and re curve back from the coast in an anti clock wise direction around the circulation. Part of the SE winds today converge back Eastwards towards the system (in the trough) NE of the Madagascar Island, South of the equator. The winds are Northerly above equator right down till 5S. As the Monsoon strikes the Andaman Sea by mid May, developing wind currents are required to be observed initially near the Eastern side of the Southern Indian Ocean, and this is weakly forming as of today, but disturbed by TC "Victoria"
2. Seasonal Low: Now, this year, the heating in the sub continent has just about started in the Eastern regions. The above normal heating in the NW is yet to start, as March was relatively normal I would say. The anomaly map for March shows a warm North, average Central regions and cooler South. This is not much of a plus point in the formation, or a quicker formation of one of the important pre monsoon weather requirment, the seasonal low. In fact, the minimum night temperatures are still below normal in central and NW India. The current one week into April is also pretty much the same. The seasonal low, stretch over Arabia thru India, normally starts forming in the Barmer and adjoining regions in the second week of April. Today, the MSL is around 1008 mb in the Sindh/Rajasthan region. There is a isobar of 1008 mb covering almost the entire Indian region.In the "core seed" area, it 1006 mb. (The ultimate low in the core, in June when ready, should be 994mb.). This progress is fairly ok. The Line of Wind Discontinuity should stabilise around Central India perpendicular down into the Southern Peninsula by mid April. 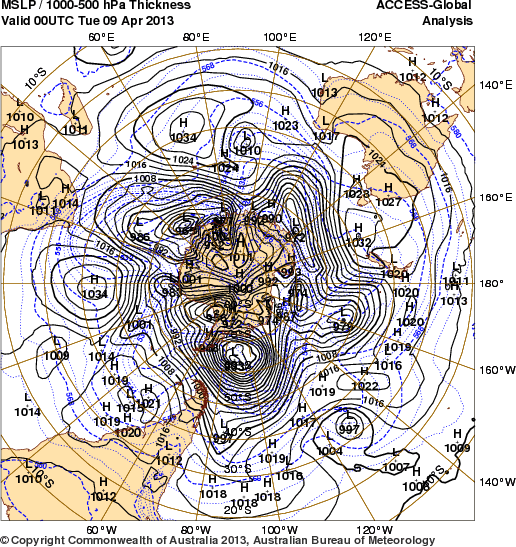 This enhances the speed of the Seasonal Low formation. Normally is required to start taking shape for the monsoon by the second week of April. 3. ENSO is now Neutral. Last SOI reading observed was +9.0. The Oceanic Nino Index (ONI) is based on SST departures from average in the Niño 3.4 region, and is a principal measure for monitoring, assessing, and predicting ENSO. The readings for the last 2 weeks is constant, no change. Thus Neutral conditions prevail. Neutral conditions expected till June at least, so this parameter will not disturb the advance and will not interfere with the date. Today, we have a "high" sitting in the Bay. The required SW winds may not yet form at least for the next 3/4 days, as the active trough still around 10S is interacting with the MJO. Summary for arrival Date: Parameter 1). -ve. Parameter 2). -ve, Parameter 3). Normal. Parameter 4). -ve. Tilted towards the negative, as of 10th April. New Readers, please note, These initial Parameters are normally (every year) considered in MW Series to guage and estimate the arrival date of SWM, not strength. Time of arrival normally indicated in MW-3, and strength after 24th April. There are more parameters are to be considered, as and when they are developed and to be taken into consideration. Next update on 18th. April. While IMD still defers its forecast, they should have taken up this job in right earnest much earlier. Really excellent. Very well presented. Need some time to digest. Really very informative and learning opportunity for me to read this. I think I will skip any forecast this year. Just re-publish yours!! Excellent explanation of various factors affecting the onset of SWM. An excellent piece of information for the beginner like me who is fond of SWM very much but was missing the many concepts of what factors affects SWM path or quantum of rain pattern till last year !! But this year it's mine pleasure to have an Vagaries as guide to learn many aspects of unfolding SWM.. Excellent piece of information.Today ,I have learned the various factors affecting onset of SWM. Really enjoyed and gained knowledge regarding the factors working behind a good successful monsoon . Praying that our journey on Vagaries of weather , with Rajesh sir and along with the Vagaries Family, which has begun since yesterday evening on "South west Monsoon Season" will end up on a good note for our country with , promising good monsoon year 2013. Beauty of Rajesh Sir - Last 2-3 years he has published Monsoon watch series with loads of information on factors/models - but every time Rajesh as something NEW to offer, knowledge to share with all readers. Really he us endless pot of weather knowledge overflowing!!! Beauty of Rajesh Sir - Last 2-3 years he has published Monsoon watch series with loads of information on factors/models - but every time Rajesh has something NEW to offer, knowledge to share with all readers. Really he is endless pot of weather knowledge overflowing!!! A little information about SST near East African Coast. Viravanullaran: There are several more parameters which will still develop and will be taken into consideration in the next few MW articles..thats why i said its the beginning and more parameters will develop..you may go through the previous years MW to get a grasp..and Thanks for your views..hope they are useful. Rajeshbhai: where are the past MW archived? Kathmandu heating up - yesterday 10th and today 11th both with 33.2 C as the max temp - anything above 34 is very rare here ; so it seems heating up quite nicely here - but guess the heat not extending into northwestern corner of subcontinent for the seasonal low to form. Neeraj: yes, the heating has started, and has spread from the terai plains...possible a local thunderstorm soon ? Plains need to heat up more for the seasonal low.. Anybody interested in following the Monsoon Watch on regular basis observing on 2/3 day interval with me..? We can monitor the parameters together, so that all can understand and learn monsoon forecasting....if many are interested, please inform , i can start from this weekend itself, posing the points to be observed...yes or no or later (after exams) as this takes a lot of time and effort..
Rajeshbhai: I am interested in participating in regular Monsoon Watch from here in Goa, right away! I was extremely busy yesterday and it was in the back on my mind that Rajeshbhai would have published his MW-1. Finally I read it now and fully endorse view mentioned above that every year he augments our knowledge. Praying that by April 18th we have few more +ve indicators!! Would love to be part of monitoring as mentioned by you. All those interested please send your mail address..
Is that windchill of -64c the lowest ever for South dakota ?.. winter storm walda is in no mood of mercy ..
Atul: MW series of 2012 put up on Archives Page..
See also the North Pole oics on that Page..
Rajesh sir, I feel last year's heating in the sub- continent was quiet slow compared to this year. Hope the( Mascarene High) develops timely as required.along with the (Seasonal low) in Thar region. I personally feel the cyclones and low's should die down by next week below the equator. Hi Rajesh, I'll be most interested too in following the monsoon watch series - I have sent you an e-mail. Thanks! One more hot day in bangalore. This has to be one of the hottest summers in bangalore. Till yesterday we have had 32 days at 34 degree and above. Of which 17 days at 35 degree and 36 degree. Appears like we are closing in on summers rains. There are dense TS in south interior tamilnadu and south interior kerela. In a week's time expect regular summer showers in bangalore. Madurai , dindigul , kumbam , rajapaliyam , kodai and gudalur in south interior TN is getting battered this evening. Hmmmm...soild TS at the right place at the right time.